Emma was fantastic German striker and brillant scorer who scored tons of goals wherever he played. His trademark was his phenomenal left footed machine gun with whom he could score from all distances and angles, counting the impossible ones. He was physically a beast, very strong with good speed, solid jumping abilities and passing range. He was also solid FK taker. Emmerich's career started at SC 09 in the district of Dortmund Dorstfeld Dorstfeld. There he played in the early summer of 1960 his first game Schwansbell for the men's team of the Association against the Lüner SV on the arena. Coincidentally, there appeared the former coach of Borussia Dortmund, Max Merkel, as he pulled the left wing of Lünen as a possible replacement for the injured Herbert Sandmann considered. Its opponents, however, was Lothar Emmerich, who scored in a 4-0 victory Dorst field, all the goals. Merkel was thrilled by Emmerich's performance and took him, instead Lünen left wing, under contract with Borussia Dortmund. 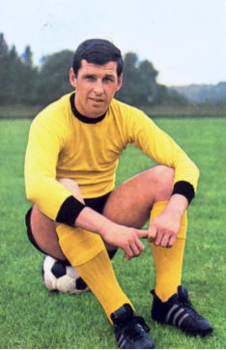 Emmerich remained until 1969 with Borussia Dortmund. He scored eleven goals during 32 appearances in the Oberliga West. In 1966 he was the sole top scorer with 31 goals in the Bundesliga with 28 goals in 1967 and together with Gerd Muller. He harmonized especially in combination with Siegfried Held. Both went as the Terrible Twins in the history of football. 1965 Dortmund won the DFB Cup with 2-0 win over Alemannia Aachen in 1966 as the first German team ever European Cup Winners' Cup. Emmerich scored 14 goals this season for Borussia. In addition, Emmerich is still regarded as one of the fairest league player ever since he was never reprimanded during his career. In 1966 he was with the German national runner-up. The team defeated England in the final in London, which was the famous Wembley goal, with 2:4. In this tournament as a left-footed shot against Spain Emma a goal from a tight angle for 1-1 draw, earning him the nickname of the left Emma with adhesive. A total of five games played Emmerich for the national team. Three successful and turbulent years in Belgium at K. Beerschot VAC, where he followed scorer in the Belgian League and was once kidnapped in front of a city derby even the surprising commitment by the Austrian first division Austria Klagenfurt, which by the financial support of the Carinthian industrialist Adolf Funder was made possible. Emma quickly became one of the top stars in the Austrian National League. 1972/1973 he was with 20 goals behind Wolfgang Breuer, SSW Innsbruck, the 22 goals scored, second in the scoring charts in Austria, 1973/74 with 21 goals again second behind Hans Krankl, who scored 36 goals, while Austria Klagenfurt always embroiled in a relegation battle was, however, Emmerich's competitors were playing at the top clubs. Following these highly successful engagements abroad, he made his comeback in German professional football at the 1 FC Schweinfurt 05, then 04, and the FV Würzburg Würzburg Kickers in the Second League South. Emmerich was in 1963 with the German champions Borussia, the last championship before the introduction of the single-track league. In 1965 he won with Borussia Dortmund in the DFB Cup and was in the following season with 31 hits German scorer. After the vice-world champion in 1966 in England with the German national team he was 1966/1967 together with Gerd Muller with 28 goals scorer again. 1969/1970, he scored K. Beerschot VAC for 29 goals and was therefore also Belgian scorer. Later Emmerich lived in Bad Kreuznach and Idar-Oberstein. He worked among others as a conduit inspector. In 1991 he was coach of the undefeated champion SV Spabrücken and was the national league West. Then he moved to SC Idar-Oberstein. He also reached there, the rise of the national league at the Union League and later on in the league. In the 1996/97 season, the district league team coached Emmerich SG Weinheim. Then TuS Kirschweiler he trained in the national league until 1999, then return to Borussia Dortmund, where he served until his death, along with Aki Schmidt fan representative. Lothar Emmerich died at the age of 61 from lung cancer. He is buried at the cemetery district in Dortmund-Marten.